The third annual Winding Roads Art Tour will take place on Saturday, May 19 and Sunday, May 20. Twenty area studios will welcome visitors from 10:00am until 5:00pm, giving art enthusiasts a rare opportunity to meet 35 artists, see their work and observe how and where it is made. Artwork will be available for purchase and artists will be on hand for conversations on creativity. The self-guided tour encompasses thirteen studios in Viroqua and seven more within a 25-mile radius of the city. 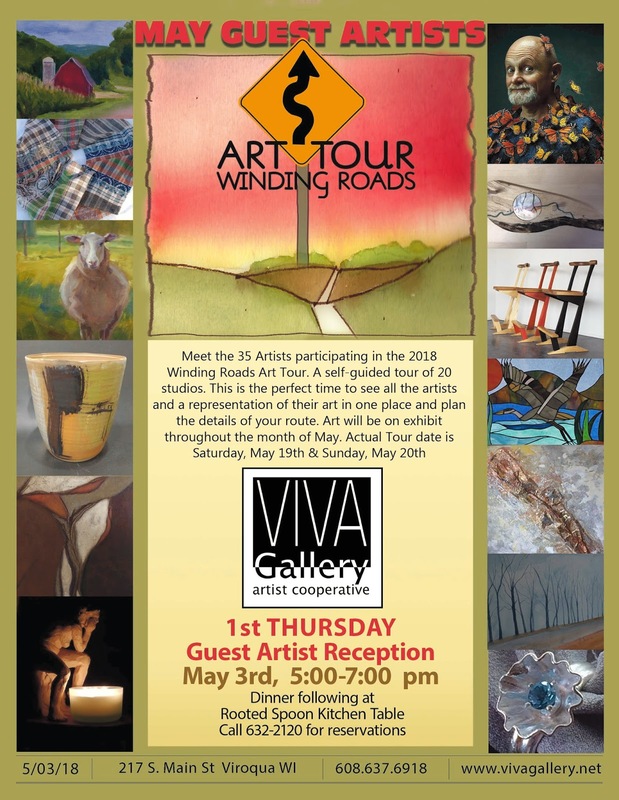 VIVA Gallery, the tour headquarters at 217 South Main in Viroqua, is perfect place to start as a piece of artwork from every artist on the tour will be on display. Karen Innis will be at the gallery both days, demonstrating her skills in that art of sculpture. Avalanche Looms, featuring the handwovens of Susan Johnson. sculptures and textiles by Leah Evans. woodworker Ken Garden and jewelry maker Raelene Roberts. Sponsors for this event include Organic Valley, Viroqua Chamber Main Street, VIVA Gallery, Vernon Communications Coop, Celeste Gibson CPS, Citizens First Bank, Ewetopia Fiber Shop, Gary’s Rock Shop,Old Towne Motel and Restaurant, Rooted Spoon Culinary, Viroqua Food Coop, and WCCU Credit Union. More information, including an online map, list of artists and list of studios, can be found atwww.windingroadsart.com., you can also find us on Facebook at Winding Roads Art Tour.